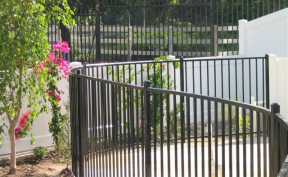 Dynamic Fence: Located in the San Fernando Valley and serving Los Angeles and Ventura counties. Welcome to Dynamic Fence, Inc. Located in Canoga Park in the San Fernando Valley, Dynamic Fence specializes in ornamental wrought iron, chain link, vinyl, and wood fencing for residential and commercial needs. Serving greater Los Angeles and Ventura counties for over 25 years, we have provided superior service and quality products to over 5000 satisfied customers. We believe our success is due to our superior craftsmanship, quality products, and unsurpassed service. We respond quickly to your needs, we provide free estimates, we offer competitive pricing, and above all, we guarantee our work!